This virtual exhibition shows some of the many ways railroads reshaped landscapes of the American West between 1847 and 1965. You may choose to read chronologically starting with the overview, or go directly to a theme that interests you by clicking on the navigation slider below. To see an image's full view and caption, click the image thumbnail. All rights reserved for all exhibition images. For permission to use an image, contact the Newberry Library. Enthusiasts of national parks, horseback trails, and wilderness were not the only ones to seek to escape from the city. This impulse also played out on a smaller scale as people escaped the city for the growing suburbs. The first suburbs were served by horsecars, and later by cable cars and electric streetcars. In Chicago, the first elevated trains began operation in 1892. The several railroads that radiated out from the city spurred the growth of more distant suburbs. This map shows four suburban communities along the Burlington line. The last one, at the western (left) edge of the map, is Riverside. A few years after the CB&Q completed a road through the area in 1863, the Riverside Improvement Company was formed. 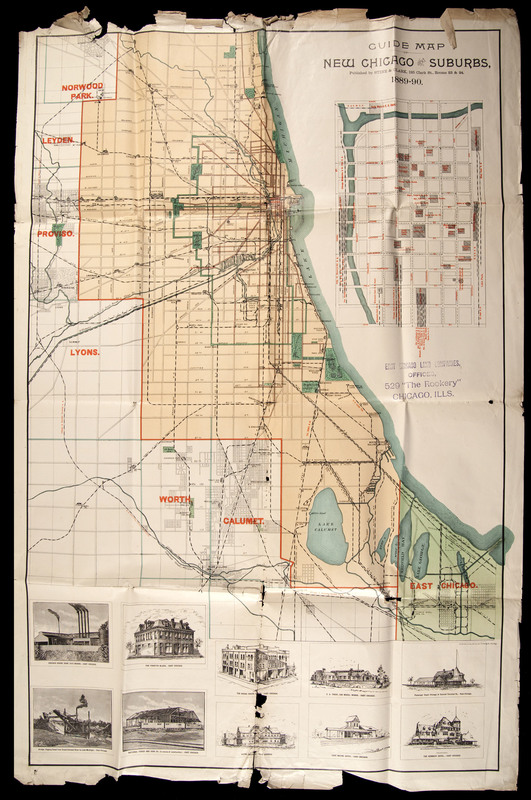 They purchased 1,600 acres along the Des Plaines River and hired Frederick Law Olmsted to design what they envisioned as an elite suburban city. Olmsted and his partner, Calvert Vaux, eschewed the usual gird pattern to design attractive curvilinear streets with plenty of open spaces and a village center. Riverside was immediately popular with Chicago’s elite, and several stately homes were built and occupied, but the Chicago Fire of 1871 and the financial panic of 1873 forced the Riverside Improvement Company into bankruptcy. The village government maintained Olmsted’s design. More expensive homes were built, as well as a Romanesque style village hall, and more modest homes were built in the twentieth century. In 1901 the CB&Q built a stone railway station. 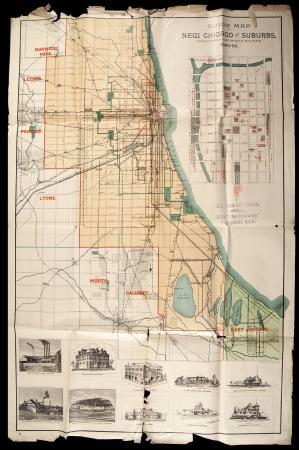 Note the parks/greenway corridor around the heart of Chicago, the southern part of it ending at Lake Michigan at Jackson Park, the future site of the World Columbian Exposition of 1893. This brochure was issued along with a notice of a schedule change and rate increase. In an effort to compete with automobiles by making travel by train more attractive to commuters, the Burlington invested heavily to improve service. In 1950 they began introducing a new line of commuter passenger cars that featured air conditioning and other luxuries. Note the recurrent focus on Progress, and the Burlington’s place at its cutting edge. Sadly for the Burlington and other passenger rail, in a few years the federal government would invest heavily in a massive program to improve road travel. The Federal Aid Highway Act of 1956 was a serious blow to the already declining passenger rail business.